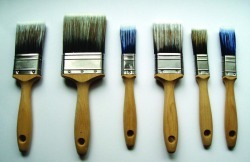 We are qualified, skilled and experienced in all areas of the painting and decorating trade. We cater professionally for domestic and commercial clients and undertake projects of any size. We are extremely competent in all aspects of painting and decorating and provide expert services including interiors, exteriors, painting, paper-hanging, cornices and coving, walls and ceilings, woodwork and much more. We provide free, competitive and no obligation written quotes and we try to commence work at a time which will best suit your needs. If you would like to take advantage of our services, require a quote or advice or have a query, please contact us. Over the years we have built a large network of contacts with whom we now hold close ties. These not only include painters and decorators, but also reputable plasterers, plumbers, joiners, carpenters, electricians, and many others that we would be glad to recommend.